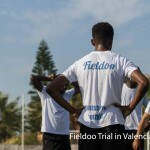 As you probably noticed, Fieldoo.com was recently publicly opened for football players – for anyone looking to give a kick-start to their professional sporting career. If you want to boost your career, showcase your skills and performances to the world, Fieldoo is the place to go! Although we’re on the beginning of our exciting journey, we’re already trying to improve our users’ experience day by day. We’re listening to your feedback and suggestions to make our service as useful as possible. 3) Press links: 5% of profile completeness. Our users can choose (mark) if they have a European Union Passport (EU Passport). In the first place it’s meant for those players who originally come outside of the European Union zone but have its passport, so they can play as national players and not as foreigners within EU countries. New Fieldoo members can edit their EU passport in the registration process (Basics). Registrated users can edit EU passport when logged-in (see below). Updated EU passport will be automatically added to players’ Public view (in the ID card at the top left side). 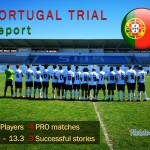 The second update is current season competition level in your Career status. Until now you could edit your competition level for previous seasons/years. Now you can also edit it for the present season. New members can enter competition level in the registration process (Career), while registrated footballers when logged-in (below). 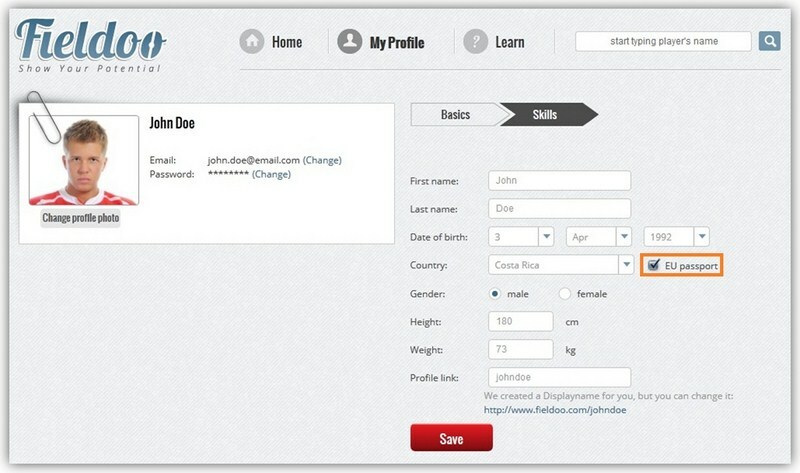 Entered Level will be seen in Career tab on Private (My Profile) and Public view (Career status). You can enter press links (clipping) in the “blue box” on the left when logged-in (see below) and not just in the “Press” tab (Add link) anymore. Press links count 5% of profile completeness as they are important for adding credibility to you. External links – backing up your profile information – allows you to give users more insight into your qualifications. 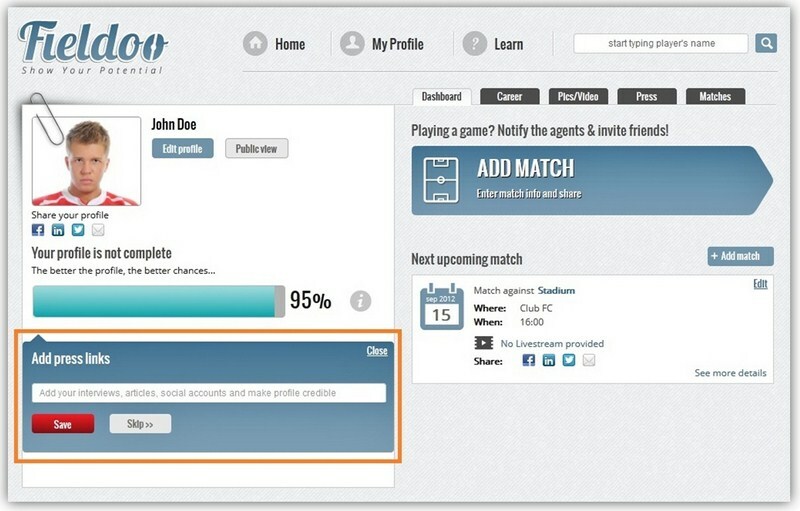 Add interviews, video highlights, game reports, club’s website, social accounts (Faceboo, Twitter…), personal blog! Everything you think it’s good for your promotion. Entered links will be seen in your Press tab on Private and Public view. Log-in or Create FREE Account to edit those updates! Fieldoo is public, start showing your potential!